Auckland Libraries, Sir George Grey Special Collections, Med. MS G.144: Valerius Maximus, De Dictis et Factis Memorabilibus Antiquorum, Italy, second half of the fourteenth century – by Alexandra Barratt and Alexandra Gillespie. The notes and images below supplement our essay, “Early Bindings on Medieval Manuscripts in New Zealand Libraries,” forthcoming in the journal Script and Print. 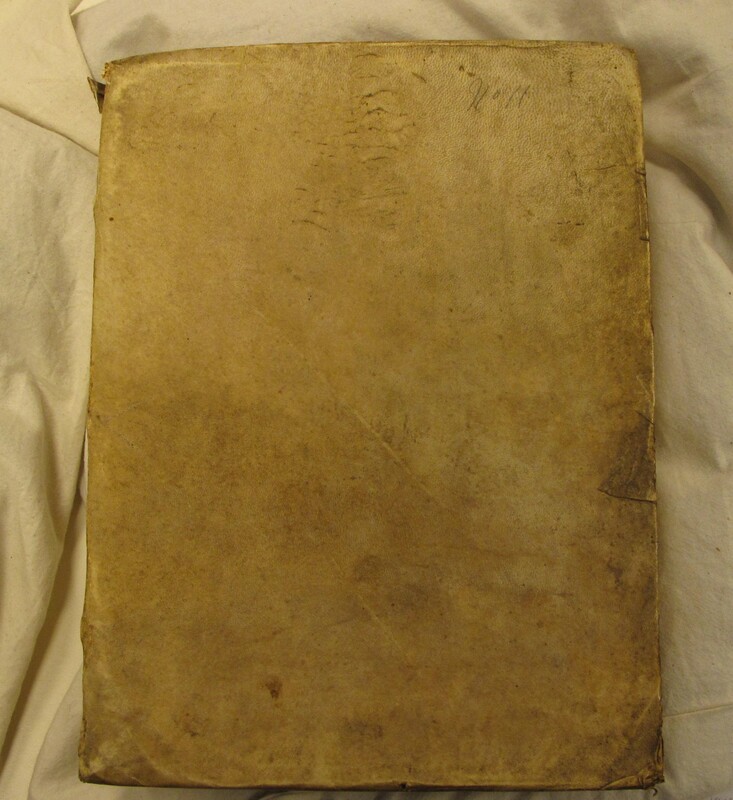 The binding of this book (Figure 1) is parchment over pulped paper pasteboards and difficult to date, but perhaps from the late sixteenth or early seventeenth century (when pasteboard became especially common). 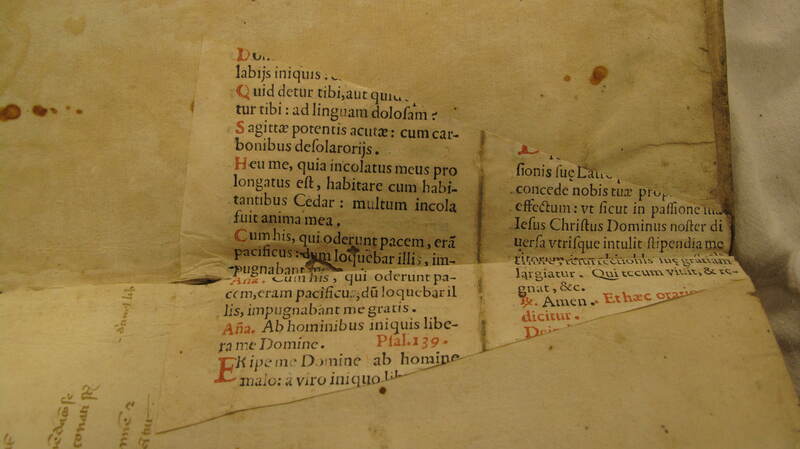 The binder has strengthened the inside hinge of the lower cover with a piece of paper cut from a bifolium of a breviary (showing the collect for Maundy Thursday, antiphons, and a part of Psalms 119:3-7 and 139:2), which was printed in duodecimo in a roman fount in both red and black ink. We have not been able to date or identify this book, but it does not argue against a medieval (i.e., pre-1600) date for the binding (Figure 2). 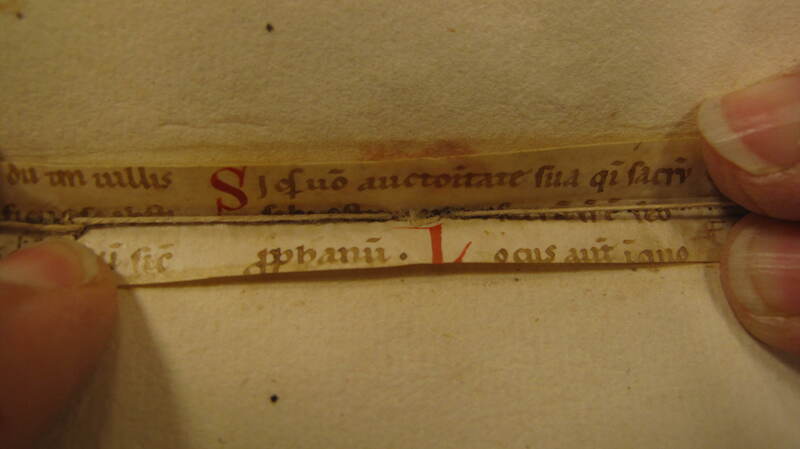 The binder has also re-used material from a fourteenth-century Italian manuscript: twenty-two parchment strips have been sewn into the centre of each quire as guards to reinforce them, a common practice in paper manuscripts in the later Middle Ages (Figure 3). In this case we were able to identify the fragments. They are part of a glossed copy of Book II of Justinian’s Institutes, which was a standard university textbook. You may happen to see some headstrong youth lazily lounging over his studies . . . . His nails are stuffed with fetid filth as black as jet, with which he marks any passage that pleases him. He distributes a multitude of straws, which he inserts to stick out in different places, so that the halm [straw] may remind him of what his memory cannot retain. These straws, because the book has no stomach to digest them, and no one takes them out, first distend the book from its wonted closing, and at length, being carelessly abandoned to oblivion, go to decay. For other examples and discussion of straw markers, see a future post on this site and our forthcoming discussion of Auckland Libraries, Sir George Grey Special Collections, Med. MS G.185. For a full description of this manuscript including its binding, see Margaret M. Manion, Vera F. Vines, and Christopher de Hamel, Medieval and Renaissance Manuscripts in New Zealand Collections (Melbourne, London and New York: Thames and Hudson, 1989), no. 23; our work supplements their accout. See also Donald Kerr, “Sir George Grey and Henry Shaw,” and in Migrations: Medieval Manuscripts in New Zealand, ed. Stephanie Hollis and Alexandra Barratt (Newcastle: Cambridge Scholars, 2007), 58; Donald Kerr, Amassing Treasures for All Times (New Castle, DE, and Dunedin: Oak Knoll and University of Otago Press, 2006), 192; Carol Steyn, The Medieval and Renaissance Manuscripts in the Grey Collection of the National Library of South Africa, Cape Town, 2 vols. (Salzburg: Institut für Anglistik und Amerikanistik, Universität Salzburg, 2002), 1:24. See Nicholas Pickwoad, “Onward and Downward: How Bookbinders Coped with the Printing Press 1500-1800,” in A Millennium of the Book: Production, Design and Illustration in Manuscript and Print, 900-1900, ed. Robin Myers and Michael Harris (Winchester: St Paul’s Bibliographies, 1994), 80. Our terminus ad quem for “medieval” bindings is adopted from J. A. Szirmai, The Archaeology of Medieval Bookbinding (Farnham: Ashgate, 1999). As noted by Manion, Vines, and de Hamel, Medieval and Renaissance Manuscripts in New Zealand Collections, 60. See Szirmai, The Archaeology of Medieval Bookbinding, 176. Cited from the translation of E. C. Thomas (London: Chatto and Windus, 1909), chapter XVII. See Jean Destrez on surviving evidence of this ad hoc practice, “L’Outillage des copistes du 13e et 14e siècles,” Aus der Geisteswelt des Mittelalters: Studien und Texte Martin Grabmann zur Vollendung des 60, ed. Albert Lang, Joseph Lechner, Michael Schmaus, Lebensjahres 1, Beiträge zur Geschichte der Philosophie und Theologie des Mittelalters, Supplement 3, 1 (Münster, 1935), 19-34. It is also discussed in some wonderful essays by Frank X. Roberts, “Marking Books: A Medieval Scribe at Work” and “Marking Books: Medieval Bookmarks Lead the Way,” Bibliobuffet, 2006-12. 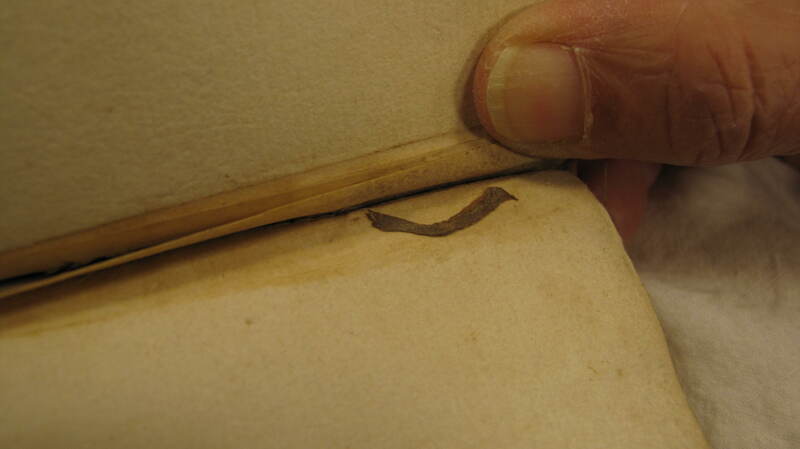 Scraps and even whole straws survive in medieval books because of the sterilizing treatment of parchment protected them from the “decay” that concerns Richard de Bury: see R. Reed, Ancient Skins, Parchments and Leathers (London and New York: Seminar Press, 1972), chapter 5.